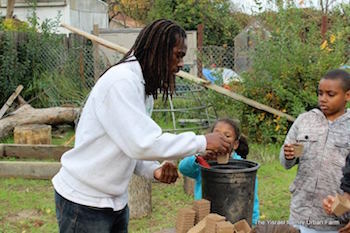 Chanowk Yisrael, founder and farmer at the Yisrael Family Urban Farm teaching children how to plant and grow food. Photo Credit: The Yisrael Family Farm. A common perception of farming encompasses the process of growing food and selling it to the masses. For many American farmers, this process represents their entire enterprise. Yet, for Chanowk Yisrael, being a farmer has greater significance for his family and community. With his wife and nine children, Yisrael operates the Yisrael Family Urban Farm on a half-acre plot in his backyard in South Oak Park, a historically working-class neighborhood in Sacramento, California. Started in 2007 as a way to safeguard his family’s livelihood in the event of a recession, it took time before Yisrael got the hang of urban farming. However, once he did and came to understand the value of farming in a community, he transitioned full-time to life as a farmer. “The planting of a seed in the ground is one thing, but you can also plant seeds in the mind, and children are also known as seeds, so when you look at farming, it’s not just the literal thing of growing food,” Yisrael says. “It’s such a rich allegory for so many things in life. Creating culture is a main motivation behind the work Yisrael’s farm is engaged in. Many of the activities of the farm are geared toward educating people about how to grow food and finding ways to solve the food poverty issues in the community. To that end, Yisrael and other interested members of the Sacramento Urban Agriculture Coalition (SUAC) worked to pass an Urban Agriculture Ordinance to allow urban farmers to sell the food they grow, something that was never approved outright by the city or county except for small incidental sales by community farms. The new ordinance, passed by the city in March 2015 and by the county in January 2017, states that urban farmers can now sell food they grow on their property at farm stands, along with eggs, jams, jellies, or other items made within a home that do not require a commercial kitchen as part of the California Homemade Food Act between the hours of 8 am and 7 pm. Yisrael recognizes the possibility of other farms opening up to grow and sell produce, creating competition for his farm; however, he believes that reality would be an advantage for his community. Beyond simply a lack of access to healthy food, Yisrael says the idea of a desert stretches into other realms of community life. “When you’re dealing with areas that are a food desert, it is often also an employment desert, an empathy desert, whatever kind of lack you can think of,” Yisrael says. The Yisrael Family Urban Farm tackles these issues through programs aimed at improving the lives and attitudes of the local residents, especially the youth. Their program Project GOOD, which stands for “growing our own destiny,” aims to teach young people how to grow food, grow themselves, and grow community, using agriculture as a way of framing that conversation. For their efforts at the farm, youth are given a small stipend if they abide by workforce type ideals, such as being on time, engaged, and a team player. The youth are taught how to give elevator speeches and can obtain a food handler’s certificate, which helps to prepare them for jobs in the food industry. Yisrael also brought many of the youth along to SUAC meetings and planning commission sessions while working to pass the ordinance to show them the process of how to go about getting things done. Another program, We Diggit, accepts applications from community members who want to start their own gardens. After a site visit and discussion involving the components of growing and maintaining a garden, volunteers and members of the Yisrael family provide tools, soil, compost, seeds, and plants to turn part of the applicant’s backyard into a 100-sq-foot garden. The organization has created between 25 and 35 gardens during the last year and a half. Through the mission of his family farm, Yisrael says his hope is to see his community turn green again. Training more people and educating more children is how he hopes that goal can be achieved.